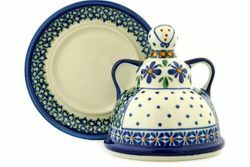 Mini Cheese Lady - this classical Polish Pottery piece is everybody's favorite! A beautiful presentation and a practical gift. Use it for cheese storage or as a pancakes warmer. Save it for special occasions, or use it every day. All the UNIKAT pattern cheese ladies have the bottom plate painted to match.